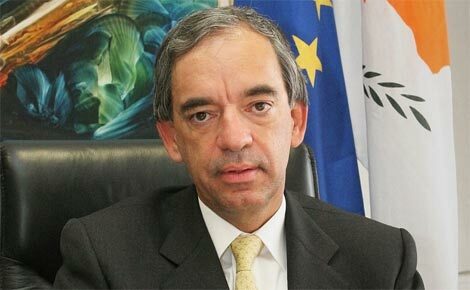 Cyprus’ former finance minister, Charilaos Stavrakis, has said that Cyprus is a small country and one can see that some people who entered politics poor have subsequently become very rich. THERE is a lot of corruption at various levels of public life, former finance minister Charilaos Stavrakis said, and the bad thing is, it is almost acceptable in Cypriot society. “In dealing with public life for the first time, I clearly realised there is a lot of corruption at various levels,” Stavrakis said in his book Economy in Politics and Politics in the Economy, presented to the media last Friday. “Many times I felt that these people’s main concern was to help certain businessmen instead of trying to defend the state’s interest,” the former minister said. Some aimed at securing important positions in banks or other organisations after retirement from the public service, Stavrakis said. The former minister said Cyprus is a small country and one can see that some entered politics poor and at some stage became very rich. Concerning himself, Stavrakis said only once did someone try to approach him. He was a Greek businessman who owned a very large company operating in the wider financial sector. “The finance minister’s signature would have fetched him huge revenues and he called me repeatedly asking to meet alone,” at a secret location. Stavrakis refused, and offered to see the businessman at the ministry in the presence of his associates. “It is then that he used the characteristic phrase: ‘are you pulling my leg minister?” Stavrakis said. The former minister acknowledged that his personal wealth was, strictly speaking, an important element. “I cannot know how big the temptation would be for someone who might be in need of extra income,” he said. That goes for lawyers, bankers, surveyors, developers, and anyone else in some sort of power. He’s selling a book for Gods sake! These revelations are better late than never . It would be good to hear some more Cypriot ministers, ex or current, spill the beans. Why not have a parliamentary debate. We can all live in hope. Perhaps Cyprusâ€™ former finance minister, Charilaos Stavrakis wasn’t fully in the “gang” when he retired from political life. It would be nice if he went the whole hog and named names and what department his crooked ex-friends are in, then maybe some of this corruption can be eliminated. I wish!! Only telling us something we learned way back in 1966. You people have really missed the point – completely. He was a finance minister at the very heart of government. If he had come out with this then what do you think would have happened to him? Course he’s not ‘whiter than white’ – can any of you honestly say you’ve NEVER done anything wrong? Didn’t think so. It’s good he’s done this at all, now, and perhaps someone in the EU will at least start to think maybe there is something to all this. Bottom line: don’t shoot the messenger. Every little chink in the armour helps. Mr Charilaos Stavrakis spent 20 years with the Bank of Cyprus and 3 years as a Cypriot Government minister. He will have therefore have intimate knowledge of the corruption that goes to the core of Cypriot society. He could perhaps have ‘come out’ earlier and confirmed that which has been obvious to many of us for many many years. Nevertheless, better late than never and so well done to him for deciding the do the proper, honest thing. Let us hope that his decision will lead to formal exposure of the high level of corruption that runs through Cypriot National and local government departments. In Cyprus it is not what the rule of law say, be it National or European; justice depends on who you are, who your relatives are, how much money you have. Everyone at the daily life level knows there are too many thieves and rascals in Cyprus, all practicing corruption in their own style, whether in banking, property construction and sales and lawyers. It is endemic. Hence, eventually, people realise from all the stories going round of no title deeds and ripped off customers. The property market and general economy deserves to die, like it is doing now. Cyprus badly led. It seems clear the answer is its very own version of what is going on in so many MidEast countries â€“ i.e. people should rise up and throw out the existing Establishment, supervise and hold Elections and vote for Honest Leadership. Of course there is “fees” to pay, how do you explain the development at Sea caves. Nobody will speak out because they are all involved and would drop themselves or some relative in the mire, although police would say that it was a civil matter so your back were you started or is it just me!! My God! is this true? Who would have believed it? Well just about everybody who has had the misfortune to have lived in Cyprus and experience this third world den of corruption. I’m one of the lucky ones who sold up and got out with my shirt still on my back before the floor fell in. Talk about stating the obvious. He really never saw this? I find that really hard to believe! Even in Court of Law. When I gave evidence in a serious case involving the death of a motorist the Paphos judge was re-wording questions from the prosecutor. Unbelievable after 35 years in British courts I have never seen anything like it. What is interesting is the fact that for years (including the time when Mr Stavrakis was a minister) the government kept telling the Council of Europe’s GRECO unit (anti-corruption it its official responses to the GRECO examinations of Cyprus that there ‘is no corruption in Cyprus’. It’s all in the GRECO reports. Regrettably, GRECO is a bit like the EU Commission in that it tends to swallow any old guff that the Cyprus govt submits because, it would appear, each member state is on its honour to be honest. GRECO sends in a small team for a few days of interviews with govt ministers and GRECO just accepts what is told by them. Its policy is not to treat seriously any contrary evidence submitted by third parties i.e. it is loaded in favour of a corrupt regime from word go. How GRECO will react to Stavrakis ‘going off message’ is uncertain but I guess it will be ignored as being ‘too inconvenient’. A possible example of this is detailed in the following article, http://www.cyprus-mail.com/pissouri/pissouri-anger-over-russian-palace/20120219, where a wealthy Russian is building a concrete monstrosity right on top of a local landmark hill which, when finished, will block out a large proportion of the previously lovely views into Pissouri Bay. The building is apparently four storeys in height, built on a basement and is very large, covering the whole top of the hill. Commenting in the article is the Secretary of Pissouri Council, a Mr Foutas, whose family, incidentally, are also local Estate Agents; Funny that! Anyway the article describes how Mr Foutas completely misses the point, (probably purposely),of the large number of complaints about the loss of the lovely local bay views and the destruction of the local environment, by going to measure the size of the ‘Russian Palace’ with a tape measure and stating that it’s ok because it does not violate the planning rules! The Village Mukhtar is apparently also doing his best Mutton Jeff impression to the complainants! Amazing what a bit of ‘healthy inducement’ can achieve isn’t it? Its a shame the former minister’s conscience didn’t click in a little earlier! If he knew all this information during his time in power then he is as guilty as the rest of them. What does he expect now, a medal!! Thousands of Brits could have been spared years of worry and financial ruin if this coward had spoken up earlier. Sorry to be so blunt but these people make my blood boil! Is he saying he is whiter than white? We have all accepted over the years that as a ‘foreigner’ we will get no help from any government department. I wonder whether this corruption extends into the EU because they have been about as helpful as a chocolate teapot so far – fobbing everyone off with bland statements and false promises of ‘investigations’. If a politician is breathing then he is probably capable of lying !!! Will there be many people who actually LIVE in Cyprus who will be surprised by these ‘revelations’? I think not. Sad thing is that it is all so widely ‘accepted’ with just the Cypriot ‘shrug’ when mentioned. A mealy-mouthed way of saying corruption in Cyprus is institutionalised, universal, endemic. We all know this from first hand experience – but if his message gets out to the wider world, it might help. Corruption thrives because the government is largely composed of a legal mafia, who are answerable to no one. And they preside over an unfit-for-purpose judicial system. Tribalism also plays a very big part. Responsibility and accountability are unknown; all that counts is money and power.